Head to the bathroom to find all those plastic containers. If you use cardboard items like toilet paper rolls or bandaid boxes, they will no longer be recyclable if they are covered in paint. If you don’t want to wash up afterwards, then use only the items which are not recyclable. You can find out more about what is commonly accepted for recycling here. Washable paint. In order for the items to be suitable for recycling after your masterpiece is created, you must wash the containers afterwards. That’s what I like about this art project. The materials do not end up in a landfill. You can still recycle them! Paper. 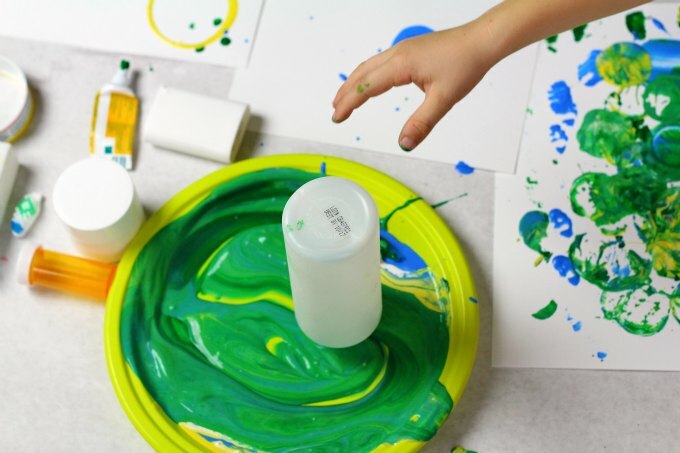 Use a nice, thick paper that can hold paint if you wish to save your creations. Plate. I used a sturdy plastic plate left over from a picnic, which I washed afterwards! Remember, if you use and dispose, it’s just more landfill. 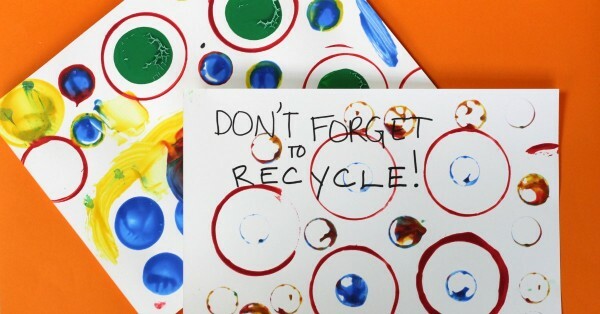 Make sure you can reuse or recycle all your materials. 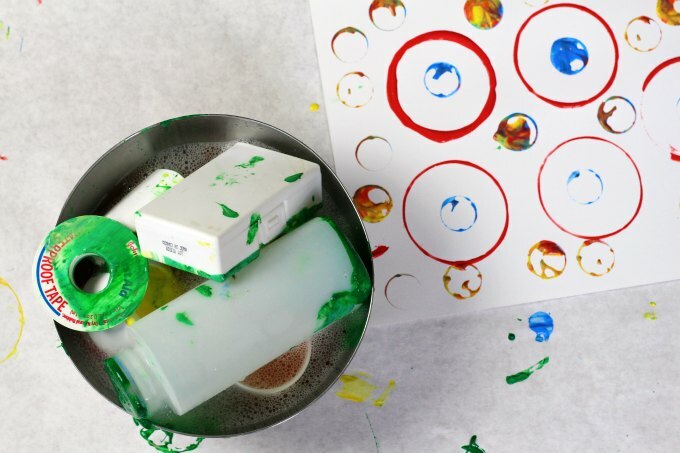 The directions are easy: Have fun dipping, dabbing, swirling, stamping, mixing and designing. After we washed our recyclables — remember, items should be clean and dry — (Honestly, the boys liked this just as much as the painting!) we dropped them in our recycle bin. You can find out more about what items are recyclable at Care To Recycle®. 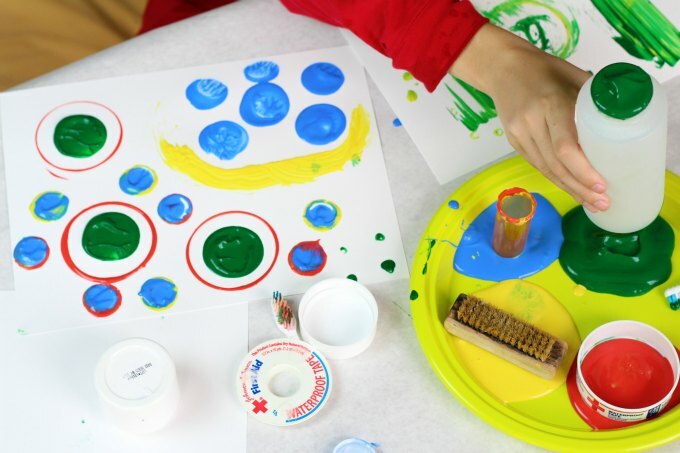 This year, Johnson & Johnson’s Care To Recycle® partnered with Scholastic to create a national school curriculum and contest to help educate students in grades 1-3 and their families about the importance of recycling bathroom products. You can find information for families and teachers on the Scholastic Care To Recycle® website. There are lesson plans, videos, comic strips and more resource links. Do we not all love a good contest that encourages kids to get involved? 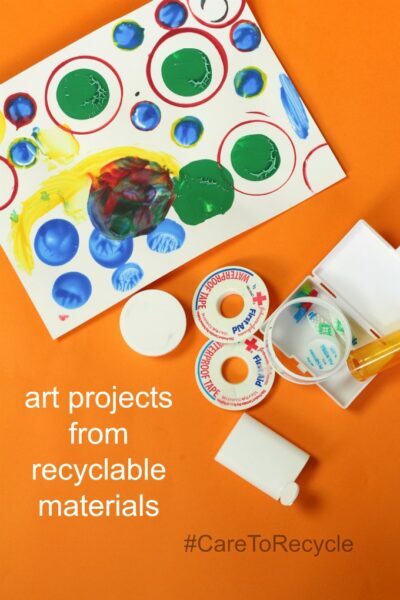 The contest, entry form and official rules can be found on the Scholastic Care To Recycle® parent site and the Scholastic Care To Recycle® teacher site. Contest opens October 1, 2015. Entries must be postmarked by October 27, 2015. P.S. Keep an eye our for PETE the Duck, the Care To Recycle® “spokesducky”. You’ll see him hanging out on the program materials and contest information. Now we have a snazzy poster to put up in our bathroom to remind us to recycle those oft-forgotten items. *2013 American Recycling Behaviors survey conducted by Shelton Group on behalf of Johnson & Johnson Consumer Inc. This is a sponsored conversation written by me on behalf of Johnson & Johnson. The opinions and text are all mine.